Whoa. Gotta give extra points to local food truckers for keeping it creative and branching out with the Muncheeze Truck, dedicated to stoner-friendly eats like grilled cheese sandwiches. 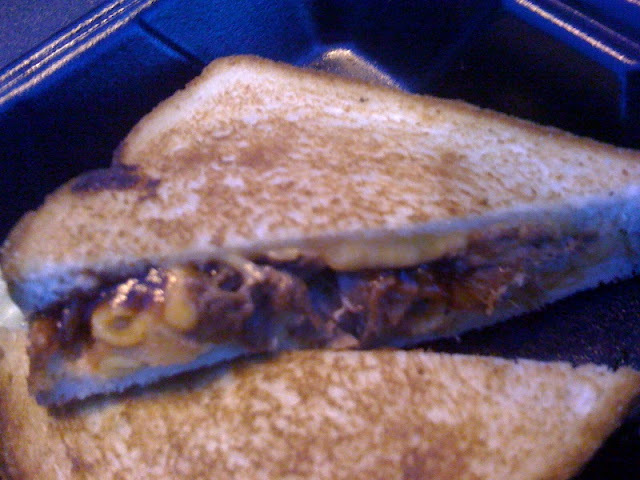 The Piggy Mac, however, is no ordinary grilled cheese. It's loaded with pulled pork, bacon, macaroni and cheese, a bit of jalapeno and barbecue sauce. So like I said, whoa. It's tasty, but excessive. I have never been a fan of putting mac and cheese between slices of bread. I just don't think it works, and combined here with the pork and sauce, and more American cheese, it's a little overwhelming. But it still tastes great and is definitely a memorable sandwich.